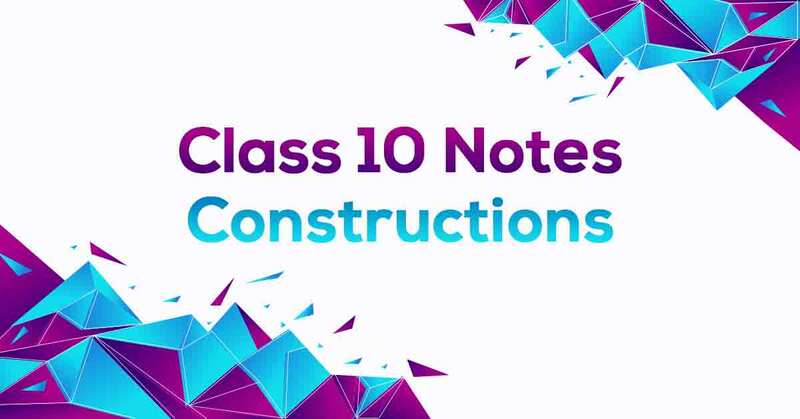 Constructions Class 10 Notes are strictly according to the NCERT Syllabus as per the guidelines by the CBSE which reduces the pressure on the students and offer them a simple way to study or revise the chapter. These notes are prepared by our panel of highly experienced teachers out of the past 15 years question papers and study material to cover each and every topic in the syllabus. Constructions Class 10 Notes would fuel your board exam preparation and increase your self-confidence. A geometrical construction is the process of drawing a geometrical figure using only two instruments – an ungraduated ruler, and a compass. A graduated scale and a protractor are used in construction where measurements are also required. Following are some basic constructions: a) To bisect a given angle. b) To draw the perpendicular bisector of a given line segment. c) To construct an angle of 30°, 45°, 60° etc. Learn More about the same in Constructions Class 10 Notes PDF.